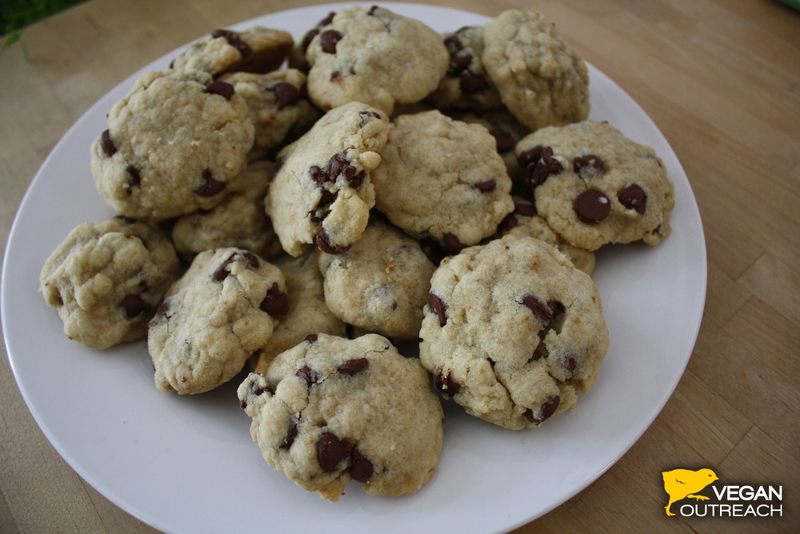 Who doesn’t love homemade chocolate chip cookies? In addition to tasting just like your grandma’s cookies, this recipe is easy to make and you probably already have all the ingredients in your pantry. They’re perfect for potlucks, movie nights, and Santa Claus loves them, too! In a medium bowl, beat sugar, margarine, oil, water, and vanilla. Add liquid mixture and chocolate chips, and mix well. Scoop spoon-sized portions onto a cookie sheet and bake for 8 to 10 minutes. While I totally and completely acknowledge and appreciate the lack of animal products in this recipe, I just have to make a comment about the health value of the ingredients chosen. White sugar, margarine, canola oil and white flour are all health nightmares – plain white sugar is not only empty but also detrimental calories and most likely made from GMO sugar beets; margarine is nothing but chemicals, preservatives and unhealthy oils; canola oil is from rapeseed and is considered a toxin in any other form; white wheat flour is highly processed and full of potential allergens like gluten. There are really healthy alternatives to all of these ingredients, like maple syrup or coconut nectar/sugar, coconut oil, bananas/applesauce, and all sorts of gluten-free (even grain free) flours like coconut or chickpea flour. Once again, while I applaud the effort to make classic recipes vegan, I would also love to see some health-conscious ingredients being used. Teaching people to live harmlessly includes teaching them how not to harm themselves within this currently broken food system. Gluten is only dangerous to people with the relating allergy (and sensitivity, intolerance). Sugars in natural sweeteners are mainly digesting down to the same kind of sugars as in table sugar. Not all sugars are created equal – some even have vitamins, minerals and other nutrients – and my main point was about plain white sugar coming from GMO sugar beets. Also, gluten/modern wheat is fast becoming regarded as a problem food in general, allergies/sensitivities or not.